Weird clothes and strange cars- wasting time worrying about people’s opinion of me. stretching from the last sandy road that snaked out of town to the Louisiana border. That’s where I first saw the man in the lime green suit. No, he was not some kind of alien from outer space. His suit had wide lapels, a matching vest and bellbottom pants. Most every week this troubadour of all things lime strode through our neighborhood. I never had a change to get up close and personal. But, from a distance, his suit appeared freshly pressed and spotless. In the warm Texas sunshine the bright lime green glowed against the dark sheen of his skin. Every time I saw the guy one word came to mind. No way would I be caught wearing something so different from everybody else. Years later I got married, started a family and moved to Canada. I don’t think the book Where the Wild Things Are had been written yet. So, I improvised. Whenever I could, I drove the kids to downtown Vancouver. Now that was poetry in motion. the cars, trucks and bicycles maneuvering one way streets through the down town core . Breathtaking. Heart stopping. I figured we’d seen everything. That was before we spotted The Car. One of my kids spotted it when we were rolling down Second Avenue, just a few blocks west of Main street. Someone had meticulously glued tiny matchbox cars to most every part of the car’s exterior. On the hood Lilliputian cars sat frozen on Lilliputian roads in front of Lilliputian street lights and Lilliputian stop signs. My kids oohed and aahed and begged to see it again and again. You know what I thought to myself? Strange. No way would I drive such a thing. Bottom line – What would people think? is extraordinary is so many ways. Perhaps the words strange and weird really belong to the people pleasers like me. We love to say that we want to be different. We insist on expressing our unique selves. Then, we try to look and think and live our lives in exact imitation of everybody else. Actually, that’s not only strange or weird. In a world where no two snowflakes, leaves or storm clouds are exactly alike, it’s bizarre. Human beings do not roll off of some kind of cookie cutter assembly line. Each one of us are fearfully and wonderfully created. 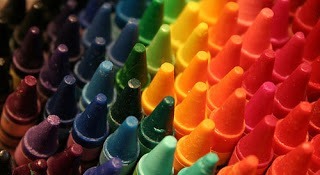 Imagine if you and I and everyone on the the planet were boxes of crayons. That’s a lot of color. Not one box would have the same shade of colors as any other box. Don’t worry about what other people may think of you. Don’t compare yourself to anyone else. Color with the crayons you were given. Trust me, you will create art beyond your wildest dreams.